Parents around the globe are facing the common challenges of balancing family and work. And the need has never been more urgent for organizations to recognize how having a family impacts an employee’s creativity, productivity and performance. Here is a useful guide to help leaders implement country-sensitive work-family policies and create family-responsible environments in which employees can carry out their work and still be fully engaged with their families. Reviews and addresses the unique cultural, social, political and economic climates in the United States, Latin America, North America, Europe, Asia and Africa. Shares examples and business cases illustrating best practices from companies in these regions. The book’s perspective is truly global, with chapters written by international authors. It brings together a diverse team including an academic expert who has conducted rigorous studies on work family conflict, a lawyer who addresses the legal environment in some countries and a practitioner with hands-on experience with real employers and employees. 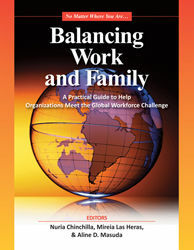 Each chapter presents an overview of the factors in a specific region impacting work-family integration, the main challenges to individuals and organizations, solutions companies have implemented and many examples of the processes companies use to foster family-responsible cultures. The authors make a strong case that it is the job organizational leaders – not HR professionals – to direct change in this important area. With this book, you have a roadmap to creating more effective organizations, societies, economies and – most importantly – stronger families.